The convenience of buying ready to use ground bison has become increasingly more common. Your bison retailer may not have that rib-eye or tenderloin you're looking for, but they will usually have ground in stock. But is ready-to-use ground the best way to go, or are you better off grinding your own? 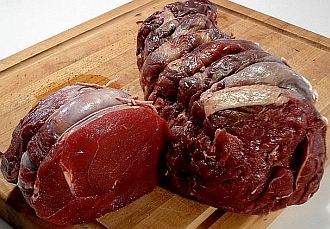 There are suppliers who provide excellent ground bison but to ensure the best, to make sure that no unnecessary connective membrane, silver skin or gristle is in the mix, why not consider doing your own? Best of all, grinding your own quality bison under proper conditions means you can safely cut way back on our suggested cooking times for well done and enjoy medium, or even medium-rare burgers if preferred. Makes sure everything coming into contact with the meat is absolutely clean. This includes knives, cutting board, all grinding machine parts, and packaging materials. Work with semi-thawed meat if you can. Thaw from freezer to refrigerator, never at room temperature. And be patient, refrigerator thawing to a semi-thawed state can sometimes take 24 hours or so. Working with semi-thawed meat in a clean working environment means virtually no bacterial contamination. 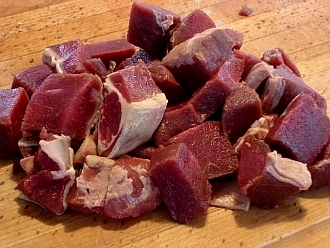 And when trimming away inedible parts you don't want in your mix, semi-thawed meat is always easier to work with than fully thawed meat. Cube the bison into 1 to 2 inch chunks. When grinding, work in small batches, 2 to 3 pounds at a time. Grind the meat in cool working conditions, not in a warm kitchen or on a hot summer day. 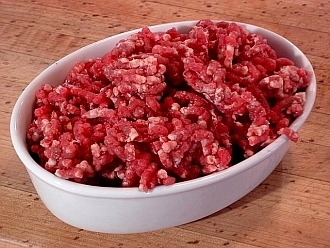 Package the ground meat in freezer bags, or butcher wrap as soon as it is processed. Freshly ground bison should be refrigerated at less than 40F or 4C -- best to use it within 36 hours; or, package and freeze immediately. Frozen ground bison can be stored for up to 6 months providing it is tightly wrapped and stored at 0F or -18C. The combination of bison meat and trim used in burgers, meatballs, and meatloaf should have a fat content in the 15 to 20% range. Even low fat bison (10% or less) can still make very good burgers etc. See our Tasty Grass-fed Bison Burger Recipe for the ideal burger solution. A grinding plate with 3/16 inch holes is your most versatile plate. A single pass makes medium textured ground; a double pass will provide fine textured ground. A tray of fresh finely ground chuck, (double pass using a 3/16 inch grinding plate). Fine grinding provides a much more homogenous meat/fat mix -- the fat is there, but fine grinding makes it much less noticeable. Although just about any cut can be used for ground, chuck gave us the best ground at the most reasonable cost. Chuck, along with some fatty trim, given a single pass through a 3/16 inch grinding plate will result in medium textured ground that is very versatile. It can be used fresh or be frozen for later use, and is perfect for burgers, meatballs, and meatloaf. For those who prefer it, chuck is also best for fine textured ground. Just grind the meat twice using a 3/16 inch plate, or once using a 1/8 inch plate. Fine textured ground is best when used fresh. Grinding rib and loin steak cuts resulted in fantastic juicy tasting burgers--even when well done. A single pass using a grinding plate with 3/16 inch holes gave us perfect medium textured ground. Be sure to include enough fat (15 to 20% content) to ensure sufficient juiciness. Ground rib and loin meat is always best if used fresh. Freezing this ground for later use was disappointing. The freezing process seemed to alter the meat's texture from medium to fine. Cooked burgers came off as being too mealy to the palate. No matter the cut, ground used in burgers, meatballs, and meatloaf is best when the overall fat content in the mix is in the 15-20% range. To meet this requirement, grind in some additional fatty trim when necessary. 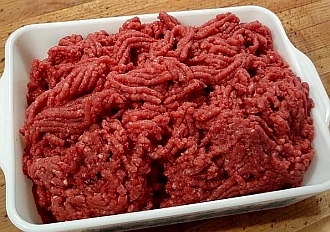 Medium textured ground bison (one pass through a 3/16 inch grinding plate) provides the best meat for burgers, meatballs, and meatloaf. Unfortunately what is all too common in the meat processing industry is a double or sometimes even a triple grind using a 1/8 inch plate. This type of processing grinds what would otherwise be inedible gristle, connective tissue and the like into very small fragments. Fragments which are practically unnoticeable to all but the most discerning of palates. Obviously the meat and fat are ground down to small fragments as well. The fat, since it melts during the cooking process, is a non-issue. But regrettably the ground meat part of it can come off as overly fine-mealy in texture once it is cooked. Clearly you can avoid over processed meat which is too fine by grinding your own. The next best alternative is to use the services of a qualified butcher. It may cost a little more, but a good butcher will trim the meat and grind it to your exact specifications. That way you will get the texture you want, and most everything bordering on inedible will end up on the cutting room floor, not in your ground meat. 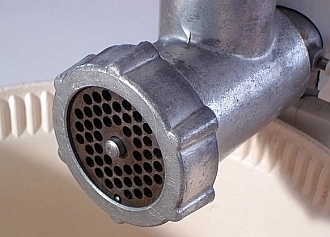 Good quality home-use electric meat grinders can be purchased for $100 to $200. They're ideal for doing a couple of pounds at a time. Doing your own ground means you choose the cuts and trim that go into the mix. Meat texture is something else you can determine. Most machines come with three different cutting plates, usually with hole diameters of 1/8 (fine), 3/16 (medium), and 1/4 or 3/8 inches (coarse).